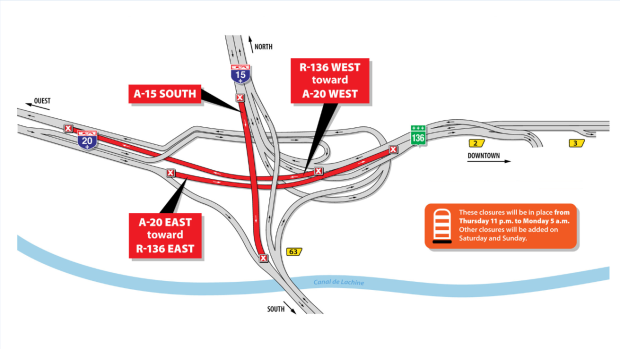 Weekend Turcot closures are starting a day early this week as workers continue the demolition of Highway 15 south. As of Thursday night, a section above the train tracks and the new Highway 20 will be torn down, in the latest of the work that began last year. The closure will begin Thursday night, explained Transport Quebec spokesperson Martin Girard. “They need time to prepare the work, so to protect the Highway 20 – that is the new Highway 20 in the Turcot Interchange – and also with the railways that pass under the old structure of the Highway 15 south. They also need to protect this area,” he said. The closure will impact Friday traffic, as Highway 15 south and Highway 720 in both directions will all be closed at the interchange. Also affecting traffic on Friday will be a major taxi protest, that will move from all direction surrounding Montreal and converge on Rene-Levesque Blvd. From midnight Friday until 5 a.m. Monday a section of Highway 20 East will also be closed, from Exit 64 until the entrance from Angrignon Boulevard. Even though traffic has never been as bad as predicted the group behind the work, KPH Turcot, is offering the same advice as always: stay away from the area or use free public transit on Friday. There will be extra train departures from Dorval to downtown at 9:35 a.m., 12:35 p.m., and 3 p.m. on Friday. Extra trains going to the West Island will leave Lucien L'Allier station at 9 a.m., noon, and 2:30 p.m. The good news: 89% of the old structure has been demolished. That number is expected to rise to 97% by the summer. Those are promising numbers after a challenging winter for workers. “Everything that we’ve dismantled so far in this area has been very, very technically challenging. This structure is roughly 20 metres high and it’s a bit different than the other ones that we’re used to because of the original design,” said KPH Turcot deputy project director Olivier Beaulieu. The new Highway 15 south should be open by the end of this year. The entire interchange is scheduled to be completed on time and on budget by the end of 2020.